In November of last year, voters in Denton, Texas sent the oil and gas industry packing, passing with a 58 percent majority a referendum banning fracking within city limits. But now the frackers are back. Last week, Colorado-based Vantage Energy began operations — legally. 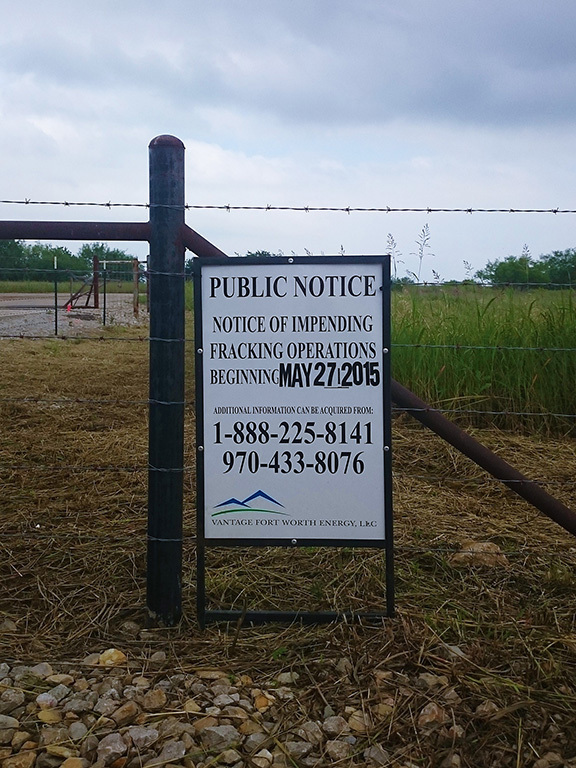 In response to Denton's novel ballot initiative, Texas Governor Greg Abbott signed into law on May 19th a bill passed by the Texas legislature prohibiting municipalities from issuing bans on fracking. Abbot said the law was designed to protect private property and boost job growth. "We're ensuring that people and officials at the local level are not going to be encroaching upon individual liberty or individual rights," he said. "This law ensures that Texas avoids a patchwork quilt of regulations that differ from region to region, differ from county to county, or city to city." After Texas officials passed a state prohibition on local fracking bans, Vantage Energy informed Denton residents that it would soon begin drilling operations. Adam Briggle, head of Denton Drilling Awareness Group and a professor at the University of North Texas, said Abbot's statements are "really out of sorts" with his small government ideology. With passage of the state law, and the resumption of drilling, a key priority says Briggle will be to educate Denton residents about the public health concerns surrounding fracking and what can be done — including unseating politicians — to send a message that localities should be able to decide whether or not they want drilling in their communities. Lindsey Baker, spokeswoman for the City of Denton, told VICE News that the city possesses options, short of an outright ban, for limiting fracking operations. "We're looking at regulating other aspects, including noise levels and regulations on [areas around schools, public parks, and residences]," she said. The process of hydraulic fracking has been criticized by a wide array of public health advocates, environmental groups, and scientists due to potential drinking water contamination, high levels of methane emissions and other forms of air pollution, and its links to an increase in the number of earthquakes in many states. The residential area adjacent to Vantage Energy's fracking site is a mobile home community on the western outskirts of Denton. The area is a well-kept collection of homes, complete with swing sets and playgrounds. A mother of two toddlers living there, who refused to give her name because she "didn't want any trouble," told VICE News that she was unaware of the potential negative effects of fracking. "I hadn't noticed the sign, and the first thing the workers across the street did was build a barrier, so we can't see what's happening behind it," she said. "I thought it was just another oil field project." Vantage Energy did not respond to a VICE News request for comment. Drilling companies often construct barriers around their drill pads. Briggle said that Texas communities were already limited in their power to regulate oil and gas businesses — and the new state law will make matters worse. "There are systematic biases in state law that didn't allow for effective regulation in our community, and [state legislators] never even questioned those once," he said. "Instead, they just do this overreach … and limited local control even further, which was the problem to begin with." Briggle complains that fracking companies are buying up huge swaths of land, with little or no intention of drilling in the immediate future, in order to avoid potentially stronger environmental or public health regulations. Like most places, under Texas law, if an oil or gas company purchases a piece of land in 2015, for example, it's grandfathered into the rules and regulations of that time. Briggle says that makes sense for most types of surface development. But, he adds, oil and gas companies are mostly sitting on their land, drilling a well or two but little more. And that means that any new Denton regulations are unlikely to have much of an impact when drilling begins in earnest. "This is a huge problem with mineral development in Texas," he told VICE News. Briggle says another problem is zoning. Industrial developments, for example, are restricted to areas zoned for industrial use and restaurants for commercial areas. But oil and gas exploration can take place in whatever part of the city a company might find an oil or gas deposit — residential areas, near schools, or adjacent to public parks. "We won't allow bakeries in certain neighborhoods, but we'll allow fracking in all of them," Briggle said. "The legislature never even touched these issues," he said, which might have helped to assuage some of Denton's concerns about fracking and avoid the November referendum. "They exacerbated the problem that led to the fracking ban. It's irrationality on a grand scale."